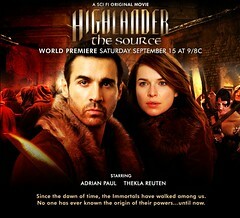 Highlander: The Source, starring my main man Adrian Paul, debuts Saturday night at 9 on Sci Fi. Since the dawn of time, the Immortals have battled down through the centuries, taking each other’s heads and living by the code that in the end, there can be only One. The world has fallen into chaos and ruin, and Duncan MacLeod (Adrian Paul) has lost all hope. But ancient wheels are once again in motion. Something is coming. And the Guardian, an unstoppable force whose existence holds the key to the origins of the Immortals, has awakened to protect it. MacLeod reluctantly joins a band of seekers — including Methos (Peter Wingfield), Joe Dawson (Jim Byrnes) and Anna Teshemka (Thekla Reuten), the woman he loved and lost — on a quest for the Source. Will it bring death, or life? To find out, the Highlander must finally make peace with what — and more importantly, who — he truly is. You can check out the Sci Fi Channel’s official Source site by clicking the graphic; there’s a short clip at the bottom of the page. I used to work for Adrian Paul and his charity, the PEACE Fund, which he created to Protect, Educate and Aid Children Everywhere. If you’ve got a few dollars to spare, I promise they’ll put it to good use. All donations help kids in a variety of places and ways, from tsunami survivors to children here in the United States whose families can’t afford life-saving organ transplants. Adrian is a hero both on-screen and off, and he’s certainly been a hero and an inspiration to me. He’s a good, kind man and a dedicated performer. Well done, sir. So check out Highlander: The Source on Sci Fi tomorrow night!